So who's your favourite Sherlock Holmes of all time? Maybe it's a question that we can put at the heart of a later series here on The Daily Constitutional. I can tell you my answer without blinking. It's Daffy Duck. No contest. The words "contains mild and frequent comic violence" are among my favourite in the English language. Especially when they herald five pristine minutes spent watching a Looney Tune from the 40s or 50s. And Daffy Duck was always my favourite. Daffy Duck is venal. He is vain. Calculating, pompous, self-centred, self-aggrandising, ruthless, cheap and a vile self-preservationist. He'd sell his granny's eyes for two bob. In fact, when the cartoon work dries up for him, he'd excel in high public office. 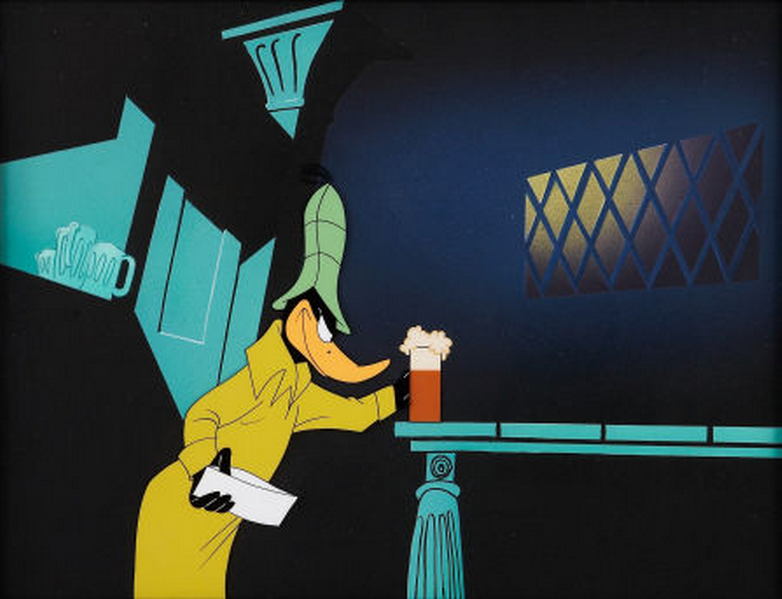 What better actor than Daffy to scale and sledge the bipolar peaks and toughs of Holmes's alpine mood swings? 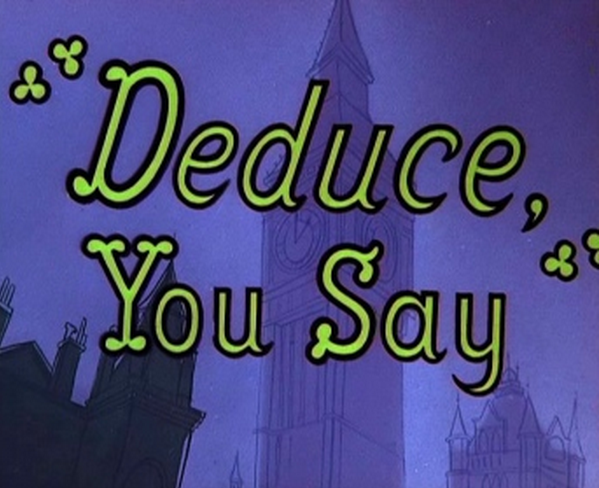 Deduce You Say (1956) sees Daffy star as Doorlock Homes with Porky the Pig in the role of his sidekick Watkins. The detective is on the trail of The Shropshire Slasher (go on: try saying it in a Daffy Duck voice) whom he pursues from his base at number 221 7/16 Beeker Street. 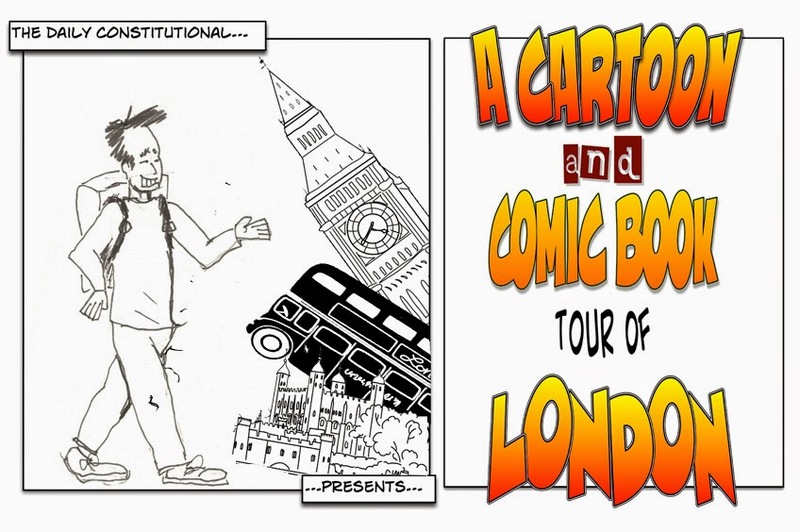 The gags come thick and fast… but mostly thick, and that's just the way I love 'em. With so many classic Daffy Duck cartoons to choose from (according to the IMDB 1956's Deduce You Say was the 80th cartoon in which Daffy featured) how does one go about rating a Daffy Duck short? I've always found my own method to be failsafe. Simply watch the cartoon and wait for the moment when Daffy's beak falls off. If it stays attached to his face, take a note of the title and avoid it next time around. This duck's a dog. If his beak slips, falls or is knocked/socked/blasted/blown off, then you are watching a stonewall classic. Needless to say Deduce You Say, has a most memorable beak-losing moment. As any cartoon connoisseur will tell you, it is possible to know within a few seconds of a Looney Tune or Tom & Jerry feature whether the cartoon will be a good one. The lines, the colours, the music of the 40s and early 50s Looney Tunes are an immediate hallmark of cartoon quality. In the 70s and 80s growing up in the UK, the words Cosgrove Hall on a TV animation was a similar guarantee of a top notch show with plenty of good laughs. As a youngster I loved to entertain the notion that Cosgrove Hall was some magical mansion where cartoonists lived and drew cartoons all day. I was disappointed (and remain so) when I found out that they were actually the names of animation team Brian Cosgrove and Mark Hall, creators of the immortal Danger Mouse. Danger Mouse (mouse superhero voiced by David Jason) and his hapless hamster sidekick Penfold (Terry Scott) is Sherlock Holmes infused with James Bond. 161 episodes were made between 1981 and 1992. … and even make reference to the fact that Holmes and Watson are jealous of their skills and fame. Daft gags abound in Danger Mouse – as do tales of budgetary restraints that would have destroyed a lesser team of animators. Ever wonder why so many Danger Mouse adventures were set at the North or South Pole? Legend has it that the white polar landscape was a popular cost-cutting exercise. A similar theory goes to explain why there were a great many "Hey! Who put the lights out?" scenes: again, no colours, only black with eyeballs blinking away. 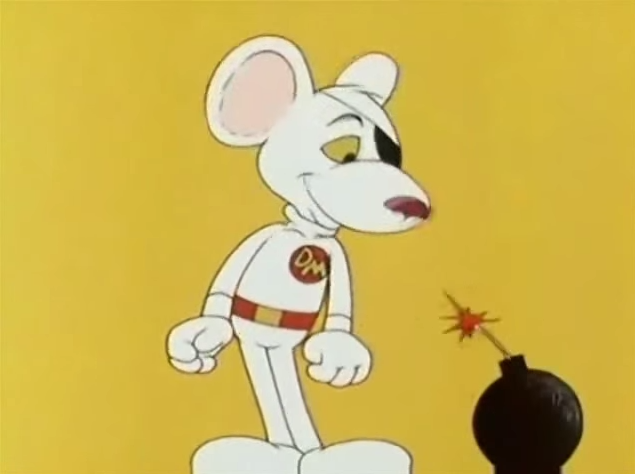 One could always recognise Danger Mouse even in a black out: he wore an eye patch so only one eye was blinking. Necessity is the mother of great comic invention! … creates a pleasingly Terry Gilliam-ish effect and despite the tales of scrimping and saving, the overall feel of the cartoon was never anything less than gleeful. That the glee may, in large amount, spring from a knowing self-deprecation is something that delights me as an adult but troubled me not one iota as a child. Perfect family entertainment with something for everyone – not least the legendary comic voice talent. 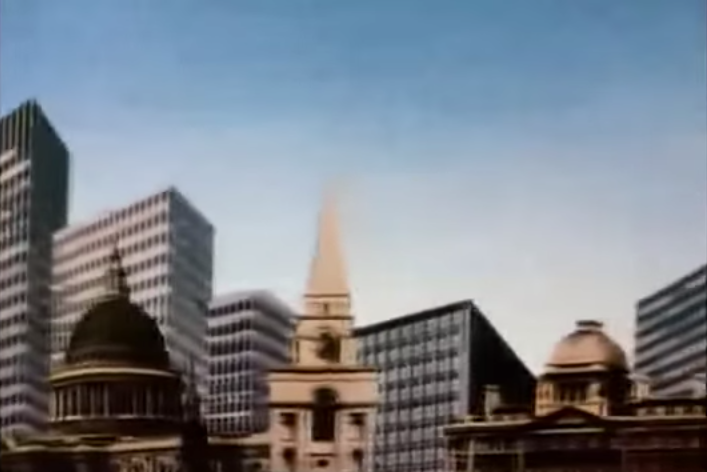 As I blog there are rumours of a reboot for Danger Mouse, featuring Alexander Armstrong and Stephen Fry. Such reboots can be very successful – see Scooby Doo Mystery Incorporated as mentioned earlier in this series – and I'm really very excited at the prospect. I only hope they don't throw too much money at it and make it all glossy. It would lose much of its quintessential Britishness that way. You can buy Daffy Duck in Deduce You Say as part of the Looney Tunes Golden Collection Vol 1 from Amazon (click HERE). Danger Mouse is also available from iTunes (click HERE). We'll be back in Baker Street later in the tour. 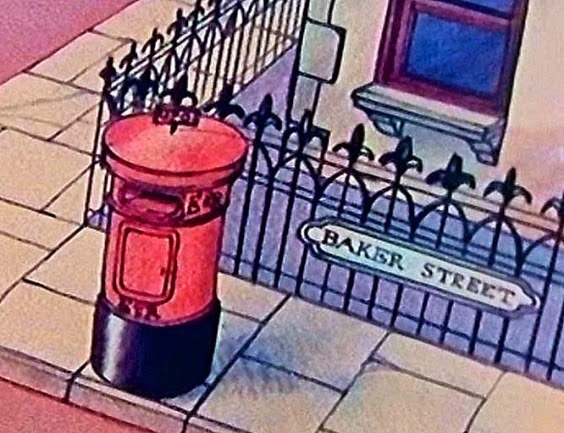 You didn't think we'd forgotten Basil the Great Mouse Detective, did you?